Ergonomic elements have been added to all aspects of the AirPro. The contoured seat and seat backs have been designed with increased comfort in mind. Multiple-sized holes in the special foam padding produce varying densities to provide extra cushioning along the spine and under the legs while comfortably supporting the sit bones. The flexible back rest features a cutaway for spinal support and a more rounded design to conform to your back; the seat's leg lifter area has a softer edge and is more contoured to your thighs. The Air Pro also features carefully selected material over the perforated foam, greatly improving ventilation so you and your seat breathe and dry out quickly. This seat fits the Ride 115 and 135. Two New Videos with Blake from Wilderness Systems! not a good all day seat . hard on the rear end . The back rest is very weak, and buckles at the base - Caution! Comfortable. You really are able to adjust it in multiple ways. Screw fell out on the bottom where the forward / backward adjustment strap attached. Unfortunately i attached a holder with 4 screws in front of the seat and now the reattachment of the strap has become another project. Over all excellent. Would be nice if some instructions came along. Love this seat. Very comfy. Decent seat. Pain free after 6 hours otw. Bought this for the wifes Wilderness 135 and she loves it. The sturdiness of this is amazing and the installation was extremely easy. Very comfortable seat. I bought this seat for my wifes Ride 115. She has the high seat, but being new to kayaking was uncomfortable with the slightly lessened stability of the high seat. I think as she gains experience she will switch bac but this seat is just what she needed. Thanks r great service ACK. I've been out on this seat 4-5 times since purchasing the WS Ride 135. One of those trips were upwards of 7 hours on the water. My back was a bit stressed the next day but that's because I'm a new paddler. I'm 6'2" 245lbs and I had to constantly readjust the seat-back into an upright position because it slides down after a while. Other than that, it's a very comfortable seat and I love the numerous adjustments one can make in order to make it comfortable. Not a 5 though because of the constant need for adjustments of the back support. My new Wilderness Systems Ride 115 came with the "High" seat which is fantastic for paddling on the lake and fishing. However, I also wanted to take my kayak through some whitewater sections of my local rivers and the lower seat was the perfect solution. It is an easy 30 second change- out. Love the stability of the lower center of gravity in the more active water. A: There is a similar seat that fit the Pungo but this one is only for the Ride series. Please contact customer service for additional information about the Pungo seat replacements. There is a similar seat that fit the Pungo but this one is only for the Ride series. Please contact customer service for additional information about the Pungo seat replacements. Q: Will this seat fit a commander 120? 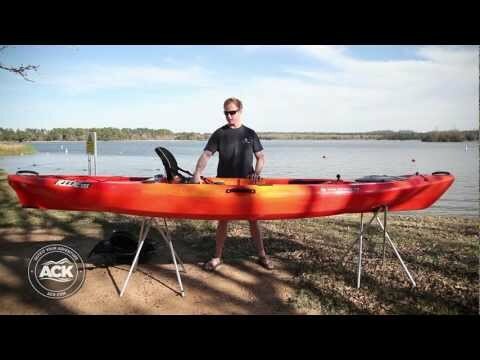 A: No, that kayak uses a different seat design and system. Q: Will this seat fit a Pescador Pro 12? Q: Will this seat fit on a Pyrahna Fusion SOT? If not, can you recommend something similar to this seat that will fit? I love the air flow and drainage that this seat offers. Q: Will this seat fit on a field and stream eagle talon 12 kayak? A: Thank you for the question. This seat will not fit on the eagle talon 12. This seat is designed to fit specifically inside of Wilderness Systems kayaks utilizing rails that are specifically molded into the kayaks hull. Please let us know if you have any other questions! Q: What are the measurements of this seat from screw attachment point to screw attachment point? I'm looking to fit this in my Perception Conduit 13. A: This seat wouldn't fit in a Perception Conduit 13 kayak unfortunately. It's a wider seat and is only intended to fit the Wilderness Systems Ride series. Q: Is it possible to attach this seat to other brands of boats with some modifications to boat if needed? I have a 2009 Necky Zoar, but I recently sat in one of these and absolutely loved the seat. A: The simple answer is maybe. Because the seat was constructed to fit specific boats, it is probably not a direct fit for yours. If you are willing and able to modify the base of the seat and create some foam blocking to make the contour of the seat match the hull of your boat - then maybe, just maybe it will work. A: Hi, There is a video on youtube about how to install a airpro freedom elite seat. I hope this is what you are looking for. Q: Will the Wilderness Systems AirPro Freedom Elite Kayak Seat - Low fit on my Tarpon 120 Ultralite? A: Unfortunately, this seat is designed for the Ride series and will not work with the Tarpon series. Q: Will this seat fit in a WS Tsunami 14.0? Q: Is it possible to retro fit this seat in a Ride 135? I think my boat is a 2011, year before these came oit. A: Unfortunately not, the AirPro Freedom Elite seats only fit the Ride 2012 model and newer. Q: Wilderness Systems AirPro Freedom Elite Kayak Seat - Low, Will this seat fit my 3 year old Commander 120? A: The Wilderness Systems AirPro Freedom Elite Kayak Seat - Low will only fit the Ride series 115 and 135. It will not fit any other kayak seating system unfortunately.